Are open porches making a comeback in Kansas City? Technically, open porches never went away. 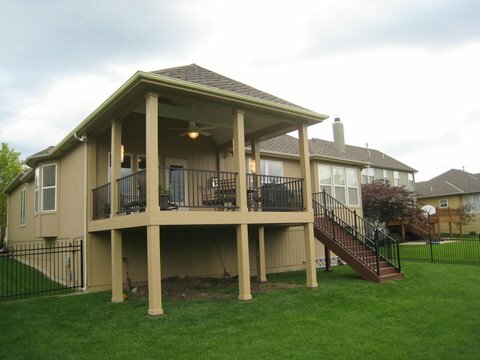 But, we do typically build quite a few more screened porches in a given year. I will talk about how practicality is a substantial determining factor in this decision but I also sense that the changing times have had an effect on our sense of having a more open environment at our homes. I personally have a large open front porch reminiscent of the open porches of yesteryear. It used to be that families would stroll down the street at night and stop to talk to neighbors hanging out on their open porches. Or, the neighbors would be having a cookout and invite you and your family over for dinner because they saw you outside. Many would say we’ve gotten away from that. With our busy lives, we have become accustomed to living very much in the privacy of our own homes. But perhaps because of the political environment or just a migration back to good old fashioned values, many of us are spending time outside and enjoying opportunities to see our neighbors or invite them to talk or spend time together. 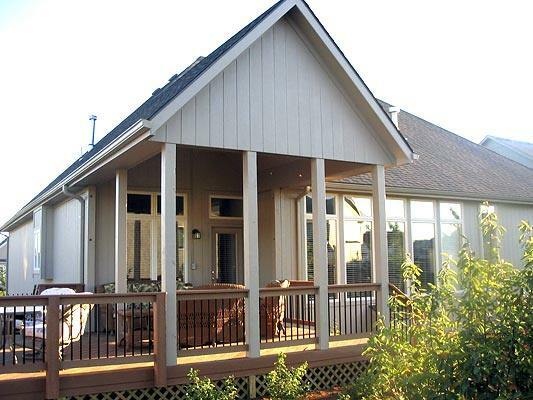 There are really 5 considerations to make when considering what you want for your porch and whether you wanted a screened porch or an open porch. 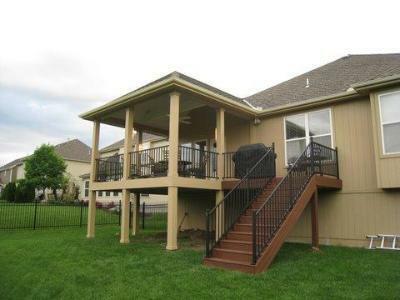 This TimberTech open porch in Lenexa KS has a very stately open feel and the design integrates into the style of the existing home. 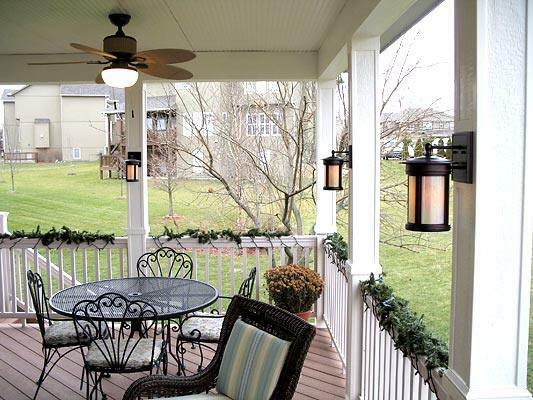 You have likely seen many screened porches that have a very plain cookie cutter design. Perhaps the physical shape of these is a perfect square. 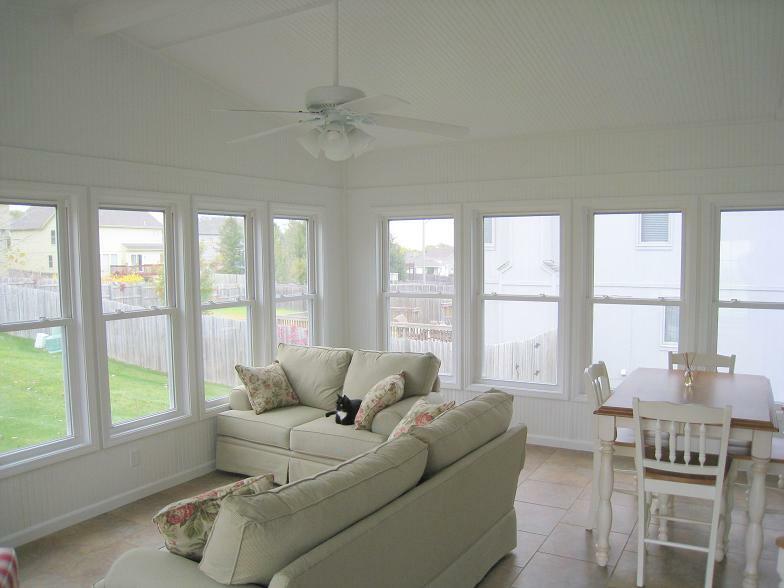 Perhaps the roof of the screened porch is a gable roof but it does not match the roof style of the home. Perhaps the porch even looks like it came out of a kit. 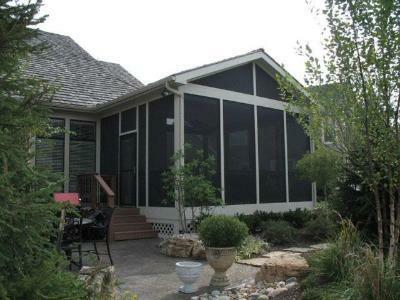 You have probably also seen custom screened porches that look like they are original to the home because the materials and architectural details down to the roofline fit the home. Custom designs often fit nicely on the back of the home vs. looking awkwardly placed or looking “added on”. One of the first things you will need to consider is whether you want a custom design or more of a “stock” design. Shelter. Shelter from the storms. Shelter from the neighbors. Shelter from bugs. It’s also important to be very practical in this decision by considering your preferences and sensitivities to these issues. Shelter from the storms. Do you want to spend a tremendous amount of time outdoors and not want your outdoor enjoyment time to be thwarted by rain storms or even strong wind? Screens reflect a certain amount of the rain because the rain will bounce off. Roof design, overhang and soffits, along with amount of wind, will influence the rain. Bugs. How much do the bugs bother you and your family. Do bugs often keep you or your family members from spending time outdoors? If so, screens might be a good option for you. Screens tend to make it feel more like an enclosed room. A screened room is still outdoors and has a tremendous amount of light and air but screens feel a little more like a wall and therefore more like an enclosed room. An open porch, on the other hand, still has an enclosed feeling but by subtracting the screen, there’s much more of a connection to the outside. The view is opened up even more so. The feel is really slightly more connected to the outdoors. It’s going to be brighter because the screens block 10-20% of the light. You can generally put columns further apart if you don’t have screens. You can do different types of columns because there are no screens interfering. There are also some design details that are open to you when you have open columns with no screens interfering. Ah, this guy always rears his head in any decision – especially in building an important addition to your home. Budget is really one of the first considerations you need to make. Without understanding your budget, your builder really can’t help you explore the options that are right for you. This entry was posted in Covered porch, Open porch, porches, Screen Porches, Screened porch on July 19, 2011 by archadeckkansascity. We received such a nice testimonial from one of our recent clients and have some great pictures of the job also so wanted to share it here. 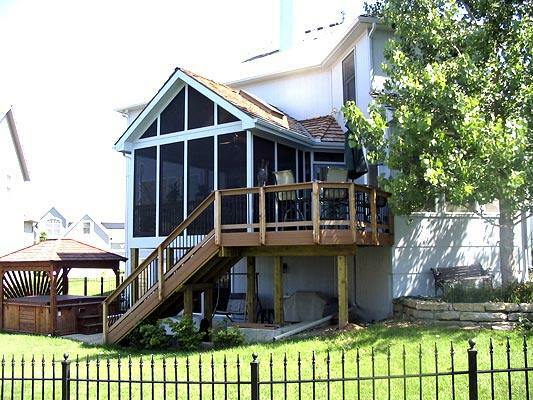 We chose Archadeck, Kansas City to remove a dilapidated deck, provide design ideas for replacement and perform all associated work. Steve has proved to be exceptionally knowledgeable and worked with us through several design meetings to determine the best design – incorporating the aesthetics we were looking for along with utility and functional layout. We didn’t want just another deck. Our desire was for an outdoor living space that was incorporated with the overall structure and roofline of the house. Basically, we wanted this addition to look like part of the original house design. Archadeck provided the design – which is a knockout! Steve is very proactive in communication and a strong project manager in terms of keeping to schedule; insuring that we were informed at all stages and satisfied with progress. The site manager and build team exceeded our expectations. All were conscientious, hard working, diligent and quality minded. On a daily basis the site was thoroughly cleaned. At the end of each workday the site team literally got on their hands and knees to insure that there were no stray screws or pieces of scrap left in the yard!! From the initial discovery conversation with Steve to the conclusion of the project, every step was documented and there were no surprises. Initial draft designs, estimates of cost and time, site drawings, blueprints, contract contents were all up-front, well detailed and in concert with expectations. Frankly, this is an exceptionally well run organization that provides superior quality and follow-up. This is not your basic “deck” building. What you get for your money…. High quality design and implementation. Finest quality of materials. Long-term employees dedicated to customer satisfaction based on workmanship and high standards. Superior project management. As an aside, my architectural engineer brother reviewed the build after completion. He stated that the quality of construction and finish were the best he had seen and that this addition would outlast the house!! I recommend this firm without hesitation and will readily use them again if the opportunity arises. 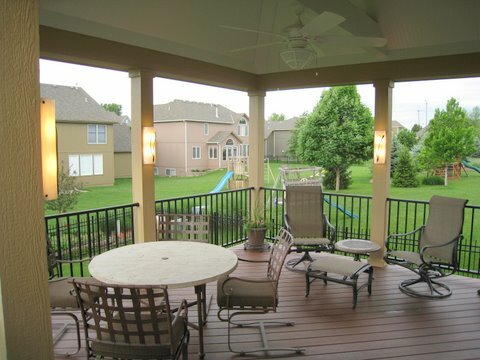 For more Kansas City porch photos, visit the photo gallery on our web site. 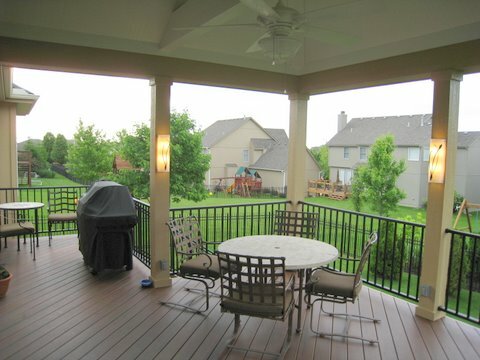 Give us a call to discuss your next deck project. (913) 851 – 3325 or send us an email at kansascity@archadeck.net. This entry was posted in Covered porch, Open porch, porches and tagged Archadeck of Kansas City, covered porch Lenexa KS, Kansas City covered porch, Kansas City porch builder, open porch Kansas City, Porch builder Lenexa KS on June 3, 2011 by archadeckkansascity. What roof is best for you? Gable? Shed? Hip? There are so many considerations to be made when you decide to make an addition to your home – whether that’s a screened porch or a sunroom or even an open porch. After getting some idea about the size you want the room to be, one of the next most important considerations is the roof. What sort of roof is best for your new room or structure or addition? The thing you really need to think about first is how the room will tie into your house. If your house is one-story, will you be tying into the house or into the existing roof? If the house is two story, what is the window configuration on the back of the house above the first story. You can either put a roof above a window line or below a window line but the roof can’t traverse a window. So, if you have a row of windows across the first and second level, the roof will either need to tie into the house in between those windows or above the set of second story windows. If you have a very large window in the back of your house, that will likely be an area where your screened porch or sunroom cannot cross. Do you remember playing with Lincoln Logs when you were young? How many roof choices were there for your Lincoln Logs house? One. Unless you had a really fancy set of Lincoln Logs, the only choice available was a standard triangular roof. This roof line is called a gable roof. When you look at children’s drawings of houses, they always have the standard triangular roof. There are a couple of reasons for this. First, a proportionate triangle is really pleasing to the eye. Secondly, most houses have a traditional gable roof and when we build a roofed structure, we try to match the existing style of the house as closely as possible. In addition, the gable roof does offer a bit more flexibility with tying into the house. The pitched slope allows us to work around some windows more easily. The size of the room might help to determine what roof style is best. A very narrow or a very wide room will cause a gable roof style to have a pitch that’s either too low and flat or too high, looking like a steeple. In that case, an alternate roof style such as a shed roof might make more sense. A shed roof slopes only in one angle which is down and away from the house. You can see a shed roof on the left of the gable picture above. That home has two different style roofs. Light is always a huge consideration. 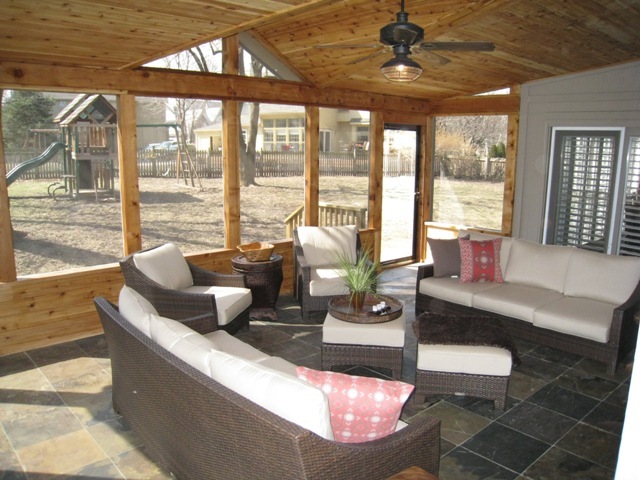 Light is often one of the reasons you want to build a screened porch or sunroom. You likely want an indoor/outdoor room. You want the sights and likely sounds of your back yard while still having protection from rain and bugs and depending on the structure protection from wind and other elements. As you see in the picture above, those homeowners wanted a tremendous amount of light which is why their design nearly wall-to-wall windows. Roof style is also a significant factor as it relates to light. Some roof styles provide more light than others. For example, a gable roof can be open at one end with either screen or glass depending on the structure. This option really lets the light pour into the room. We would be remiss if we didn’t include cost as a consideration. As you can imagine, not only was it less expensive for Lincoln Logs to only have one roof option, a standard gable roof and shed roof are less expensive than other options. There are a couple more somewhat standard options for roof styles. The first one is called a hip roof. You can see a picture of a hip roof in the diagram seen above. 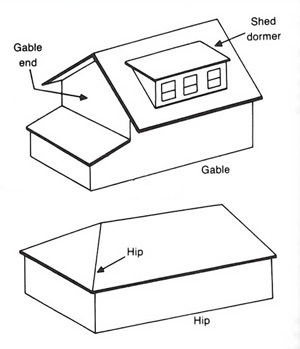 A hip roof is a gable roof with a third slope across the front. A hip roof has a tremendous amount of aesthetic appeal and can be seen on many upper-end houses. But, a hip roof is the most expensive to build. It has more complicated rafters, more cuts, and requires more skilled carpentry, etc. There are also combination roofs. One that we offer that’s very popular is a flat roof with a small gable. This is a popular style of ours. Probably one of the biggest reasons this is popular is because it has a custom look and has a custom feel. If you are having a contractor come and build an addition to your home, you want more than a cookie cutter room. You want something beautiful and functional and you want a place where you want to spend lots of time. This entry was posted in Covered porch, Outdoor design series, porches, Room additions, Screen Porches, Screened porch, Sunrooms on May 11, 2011 by archadeckkansascity.